No iPhones on sale yet... but you can get a case! We figured it was only a matter of time before these started washing up on our shores. As if the wait for iPhones wasn't enough, now we have iPhone cases months before the actual phones arrive. That's really rubbing it in - thanks, guys! The case has a quality worth admiring. There's a hip clasp with a flip-down lock on it. You push down a clasp that fixes the case to your belt. When we tried to rip it off - as will doubtless happen to some unlucky people - it wouldn't budge. There's a front flap that will hold an aluminium plate inside its stitching. This took some serious abuse without buckling. The quality of the stitching seems tough, too, and all around the interior is soft felt lining to keep your iPhone pretty. It's also mercifully inexpensive. 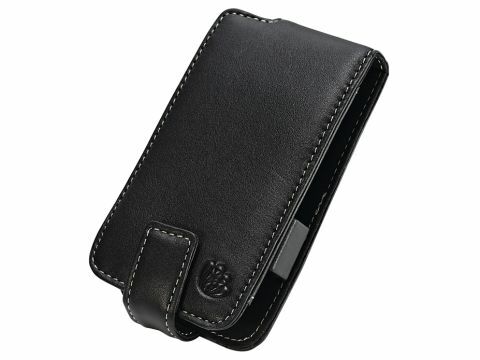 All-in-all this is a well-built protective case for anyone stupid enough to carry an iPhone around on their belt.